If I am a witch, they will soon know it. I had never ill wished anyone but as I fled Beulah anger and hatred clashed together, sparking curses like steel striking flint. I had done no wrong, so why was I forced to rund like a fugitive? My accusers, Deborah Vane and the other girls, they were the guilty ones. Even as they denounced me as a witch, their eyes gleamed with scheming malice. The madness twisting their faces was counterfeit. It came to Agnes unbidden: a vision of Mary Newbury, a young woman driven from her Puritan settlement, accused of being a witch. It is an image of a life about to change radically, as Mary defies all accepted norms — embracing independence, love, and loyalty to a Native American community that accepts her as one of their own. The two women’s lives are separated by almost four hundred years, but they are linked by more than blood. For, like Mary, Agnes has special powers — powers that Mary seeks to ensure that the rest of her story is told. 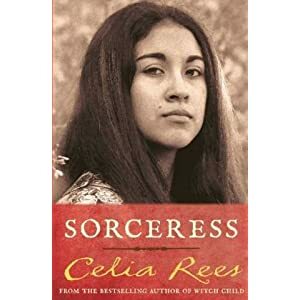 Whilst planning for my witch themed book, I knew instantly that Sorceress should be on my list of books to read, as the first book in the series 'Witch Child' had been one of the first fictional witch books I had ever read. In fact, it has now astounded me how many are now available, considering how few paranormal books could be purchased ten to fifteen years ago in the UK. I have to say from reading both the books in this series, I loved Sorceress the most. I couldn't put it down and I was so glad to be back in the company of Mary, alongside her new spiritual companion Agnes. In this sequel, we find Mary ousted from the New England community and saved from death by Jaybird, whom had featured in the first book. The budding relationship between Mary and Jaybird, begins so beautifully as she becomes accepted within the Native American community. Unfortunately life is not easy for Mary and her family and she experiences situations that no one should ever have to deal with. This is definitely a case of 'what doesn't kill you, makes you stronger.' A couple of the scenes I found were rather gut wrenching and left me contemplating my own family. Within the first book, the story was told through the hidden journals of Mary that were discovered in an ancient quilt. I was pleased that Sorceress took a different approach and the story was told through the eyes of Agnes, who has a family and spiritual connection to Mary. I loved the fact that the ways of the Native Americans were described in such detail within this book, as I have always found them so fascinating. I have always been compelled to find out more about their beliefs as they are just so different to the society in which I was brought up in. I love that their belief in spirit is so strong. Celia Rees has managed to bring their traditions and beliefs alive in this book, encouraging further investigation by the reader. I loved the way the book almost felt real. The way it is written has you questioning whether it actually happened or not. You wonder if Alison Ellman is actually real, and really has been investigating Mary's life. I found it gave an interesting slant to historical fiction. Some of the information provided in the book details the real history of the Native American race which only added to my speculations. This book really had a completely different feel to it from Witch Child. Witch Child was caught up with the traditions of the English settlers, which seemed rigid and claustrophobic, where as the Native American traditions allowed for more openness and freedom. My favourite scene in the book is the tender steps taken into the blossoming relationship between Mary and Jaybird. The way it is described brings the tenderness and first feelings of love alive. It made my skin tingle as I read how Mary how finally found some happiness, even though it was to be short lived. It is plainly obvious that the author carried out extensive research before embarking on this story. I would even believe that she wrote out the back stories for the majority of the characters as a few are included in the transcripts. This book feels like a labour of love. The author has taken time to bring all her characters, including the secondary ones to life. She has made the book feel real and I came away quite inspired. Mary is a strong character, who fights adversity to find her own pathway through life. As to whether she is actually a witch, that is questionable still. Personally I view her as a healer. She learns how to save people using the methods she had been taught by her grandmother and White Eagle. She was probably at the forefront of modern medicine that we experience today. Celia Rees has long been a favourite author of mine and I would definitely recommend that you read one of her books. This sounds so good. Celia Rees is one of those authors that I keep meaning to get round to trying but never do. You've convinced me that I must. I've never read her before, can you believe it? I'll start with Witch Child, but this sounds excellent too. Gosh this cover is awesome. I love the penetrating stare of the young girl. I think I have Witch Child on my shelves...will have to look. Jenni - oh you must. One of my favourites of hers is The Bailey Game. Oh and Pirates! Nymeth - I preferred this one to the Witch Child. Loved Pirates and The Bailey Game too. Susan - I enjoyed it even more than I thought I would. Christina - out of the two I liked this one better. I think it is the dual story running through past and present that I loved. I have Witch Child in my tbr pile (on my Kindle I think). This one sounds really good. I'll definitely be looking into the rest of the series. Sounds like a good read, I need to add this author to my tbr. I like stories that have you wondering if it really happened or not. I've only read one book by Celia Rees so far but I'd definitely like to read more. This one sounds pretty good too. I'm currently reading A Discovery of Witches. I'v read two books by Celia Rees this year and enjoyed them both. I really should read some of her others!